With Game of Thrones final season just around the corner Mountain Dew’s new ad campaign and contest idea has got us fans pumping with double the excitement. 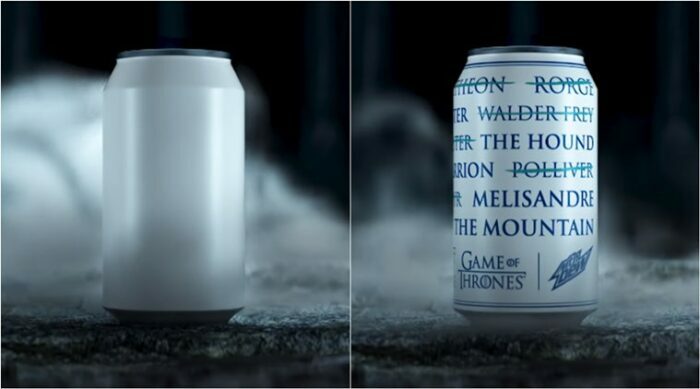 Mountain Dew found its new inspiration in Arya Stark of Winterfell and went brandies and nameless as a part of its new marketing campaign. 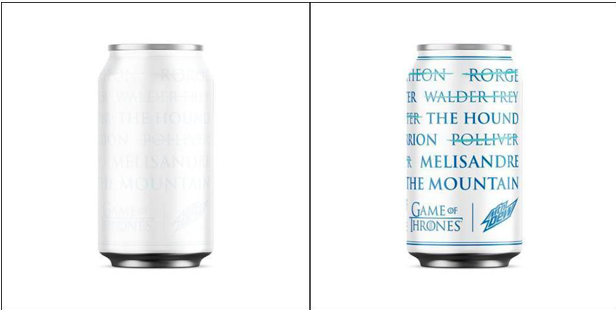 The company introduced special limited edition GOT cans dubbed by “ACanHasNoName”. The cans are crafted in a unique way. When warm they appear as white as the snow reminding us that “Winter is Coming” and once chilled reminds of us the the famous Arya Stark’s notorious kill list. Sadly these cans are not available at the grocery stores or online! But here’s how you can get your hands on them. You can win yourself the limited edition can by being a part of this fun Game of thrones contest where you simply have to share what you’re willing to sacrifice for the throne using the hashtags #ACanHasNoName, #ForTheThrone and #MTNDEWsweepstakes. Got fans in NYC and LA can also hunt for the Master of Coin around the city and once found utter the “ancient password” that will get you a coin that can be inserted into a special iron Throne-esque vending machine. While Mountain Dew surely deserves an applause for the its well thought campaign idea it’s hard to believe that the countdown to the big day has finally begun!